Designed to fit anywhere in the home and will pair in seconds. View larger Never miss a sound tanks to an interference free and secure connection featuring the latest DECT technology available. The SEW-2001W is a wireless audio monitoring kit to be an extra set of ears for your baby. 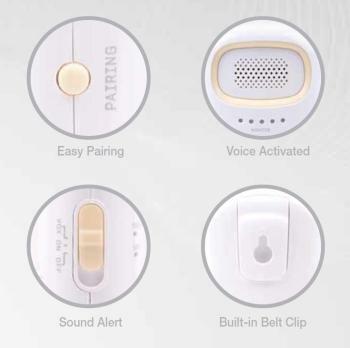 The pairing is easy so that a parent unit and a baby unit can be connected just by the push of a button. The voice activated function keeps the speakers quiet until baby sound is detected and keeps static noise level to minimum to keep the baby environment healthy. 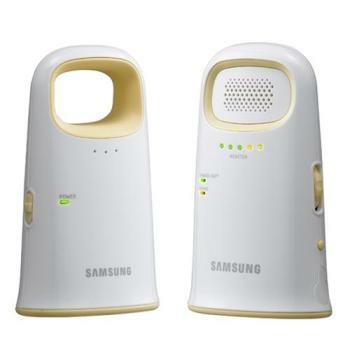 The parent unit comes with belt clip for simple portability and it activates the sound alert when the unit is out of wireless range or detects baby sound. The SEW-2001W will be the simplest solution for your baby care giving you a peace of mind. The SEW-2001W features the latest DECT Digital Wireless technology, bringing you a fuller and clearer sound quality. This ensures that you won’t miss a beat when it comes to how your baby is doing. The DECT Digital Wireless technology also features a 1.8 GHz secure signal that ensures you an interference free connection. The SEW-2001W also has an unbelievable range of up to 900 ft., giving you total freedom, convenience, and security. The SEW-2001W gives you a simple and elegant design that will compliment any decor. Pairing your monitor to your parent unit is as easy as pushing a button. With the built in belt clip, an unmatched 900 ft. range, and a sound alert that alerts you in case you are out of range or detect your baby’s sound you have complete freedom to go about your business with a peace of mind. It’s truly the simple and secure solution to your baby care needs.